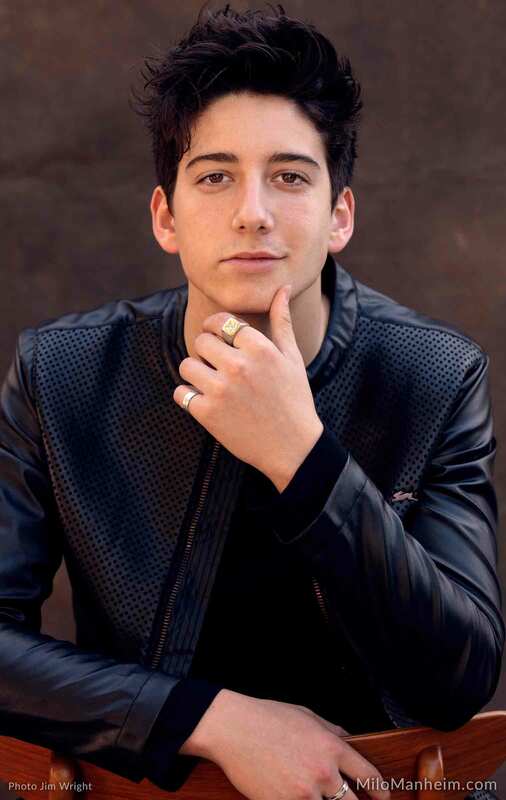 Milo Manheim is an up-and-coming American actor born and raised in Los Angeles. He began his acting career in a local after-school program in Culver City at the age of seven, and he soon went on to perform in 15 musicals with Liza Monjauze Productions. These musicals include: Rent, Footloose, Tommy, A Chorus Line, Gypsy, and Spring Awakening. Milo was discovered when casting director Amber Horn saw his performance as “Roger” in the musical Rent. This was a pivotal point in his budding career as she brought him in to audition for a new Disney Channel musical, Zombies. Milo booked the male lead, and Zombies is now set to premiere in early 2018. As the only son of Emmy and Golden Globe award winner Camryn Manheim, Milo grew up on the set of The Practice and Ghost Whisperer, and he developed an appreciation for the craft at an early age. Milo was most recently seen in the new musical Generation Me which was performed at the Hudson Theatre and Playwright Horizons in New York City. He won the “Best Leading Actor” award for his role at the 2017 New York Musical Festival. Following in his family’s footsteps, he is an avid participant in community service and charities. After his role in Generation Me, Milo became an advocate for teen suicide prevention. He has also worked with a variety of different organizations to give back, including Bread & Roses Restaurant, Pediatric Aids, Poker for Puppies, Buy Life, and Foster Cares. Milo has volunteered with the Venice Family Clinic which provides health care to low-income residents, and he worked with disabled students at McBride Elementary to get them involved with the arts. In 2008, Milo contributed to the Obama campaign with funds raised from a lemonade stand and was invited to Washington D.C. to attend the inauguration. In Addition, for the past six years, Milo has been involved in Robert Kennedy Jr.’s Waterkeeper Alliance, and he had the opportunity to interview Robert Kennedy Jr. on a CBS news segment about the environment. Milo also participates in Chords2Cure, a non-profit organization benefiting pediatric cancer research. Milo plays guitar, drums, piano, and ukulele, and he dabbles in various wind instruments. Aside from being a triple threat in acting, music and dancing, Milo also enjoys sports such as soccer, volleyball and skiing. Milo’s goal is to branch out into complex comedic roles, and he hopes to one-day work with his acting inspiration, Jim Carrey.